This entry was posted on May 22, 2014 by raberry65. 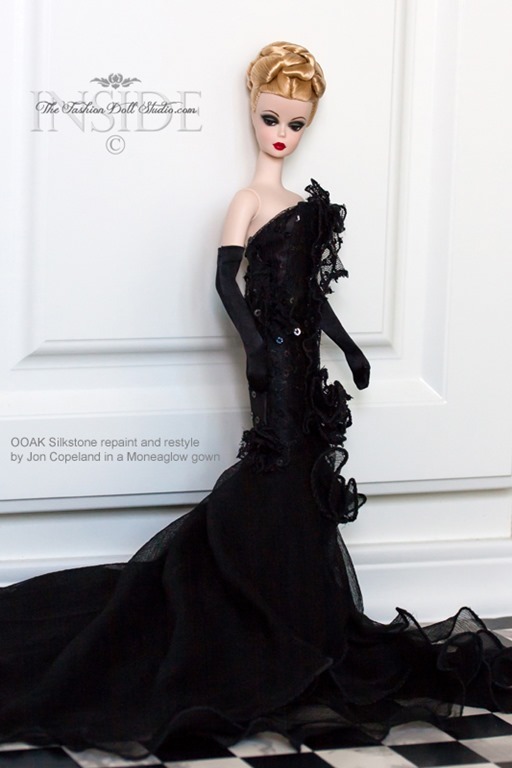 It was filed under Barbie, OOAK Barbie and was tagged with Doll Photography, Inside the fashion doll studio, ITFDS, Jon Copeland, Mila Silkstone Barbie, OOAK Barbie, OOAK Silkstone Barbie, Rebecca Berry Photography, Repainted dolls, restyled Barbie. Wow, she is gorgeous. I love her make-up and hairdo so much. She has a 40’s look. Simply stunning. Hello my friend! Yes, she definitely has the 1940’s glamorous star look to her. Jon did an amazing job on her. there are just no words, sigh…..pure perfection on all levels. 🙂 Jon does the most exquisite work….as do you. She is truly fantabulous!! Her hairdo is simply amazing, the color blend SO lovely. 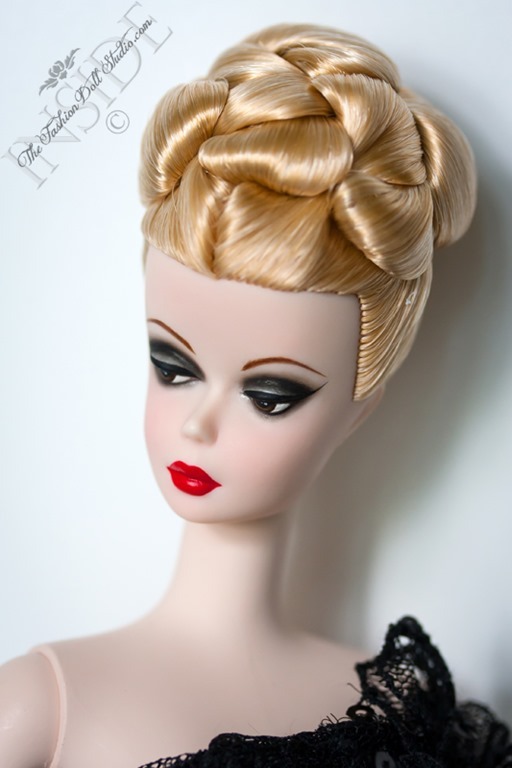 The opposition of her gorgeous dark smoky eyes and vixen red lip with the bright sunlit blonde hair is perfection. She’s giving me a fantastic film noir vibe, especially in that stunning raven gown. That was my thought as well Lisa! Given your expertise in the film area, I feel good that I saw it too. Thank you for the comment. Her hair is stunning! I am amazed as what ppl are doing with hair! Must be magicians! Thank you for sharing. Magicians indeed…and…lots of hairspray I am thinking 🙂 I am glad you enjoyed. Rita Hayworth, Betty Grable, Lana Turner … pure perfection, as stated above. Yes indeedy. Those names were coming to mind when I unpacked this one as well. Those smoky eyes and red lips scream 1940’s. I wonder who she is!She is Mila!What an amazing transformation! I know right?! You would never guess she started out as a Mila. Thank you Peter!! I am glad you enjoyed her. 🙂 There are multiple points on which I marvel at this repaint and restyle. Jon never fails to amaze. I do indeed feel lucky. I am glad you enjoyed the photos. Everything about her is beautiful! I love the eyes. Yes, the eyes are really quite something on this one. The pictures really don’t do it justice. Thank you for the comment.